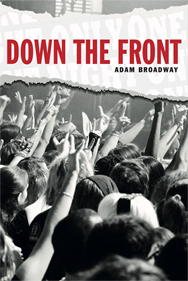 Down the Front is a book about gigging. It describes the attributes of listening to music, live. Since my first real gig, Random Hold supporting XTC back in late 70s, I have been fortunate to have seen hundreds of live gigs and plenty of festivals. Down the Front tries to capture the elements that can make or break a great live show. The venue, the support band, festivals, the headliner, the crowd, the odd celeb... all contribute to the event. Through real stories and anecdotes, my book sets out the search for the perfect gig. I hope you enjoy it! BUT there is more... music is a bond. So many of us find refuge in music in this crazy world... so I’m planning my next books. I want to hear your stories. Let’s share our passion for live music together. Check out below as to how you can contribute to my next project. You have heard about my musical stories and I hope that they stirred some memories of your own. As the music journey doesn’t stop I have two new projects under way. The first is an update on my gig experiences since completing Down the Front. So look out for a Down the Front version two. But more importantly I am looking for your stories. I would love to hear from you! Were you at any of the gigs I attended? What were your thoughts and memories? I want to hear and capture your stories.